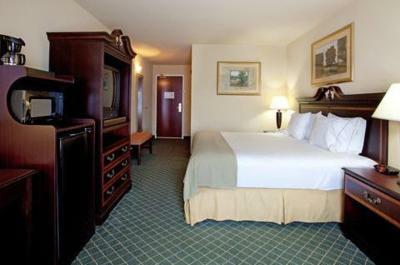 Lock in a great price for Holiday Inn Express Hotel & Suites West Monroe – rated 8.7 by recent guests! I was impressed with the breakfast. But the thing that warmed my heart was the area set up for children to color, write letters to Santa, and decorate reindeer. I like the beds were comfortable and excellent wifi connection. Breakfast was good as well. Great facility and very friendly staff. We arrived in town a little early so we called to see if we could check-in and from the moment they answered the phone to the time of check-out, it was a great experience. The breakfast was better than I have come to expect from "breakfast included" hotels. I enjoyed the facilities and the staff was friendly and polite. Easy access to just about anything in the area and close to restaurants. Local shops nearby made it easy to just go get what you needed and get back. Very clean, large room. First place I've stayed in in a while that had a microwave. That used to be standard a long time ago, so i really felt like it was a plus. I loved the front desk receptionist. She was extremely friendly. My booking didn’t go through, so she found a suite available and made it the same price as what I’d initially booked because I needed two beds. The hotel was in a great location. Wasn't in town but right outside of it. Like 2 min from all the restaurants and the movie theatre plus a Walmart was 5 min from it. So if you needed anything just a couple min away to get it. Great size pool. Had a walking trail/park behind it if you didn't want to exercise in the hotel. It was Clean and beds were comfortable. The mall was about 10 min from it also. Staff was friendly. I loved the cleanliness of the room. Just walking through the halls had a great smell and the floors were soft and cushioned.The mattress was as comfortable as the one I have at home! The staff was awesome. They were very friendly and helpful. Will stay there again next I’m in town! 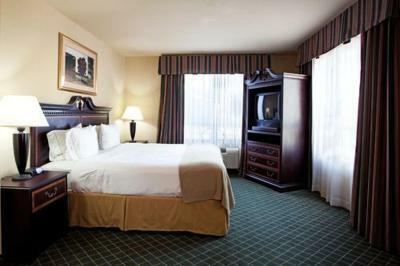 Holiday Inn Express Hotel & Suites West Monroe This rating is a reflection of how the property compares to the industry standard when it comes to price, facilities and services available. It's based on a self-evaluation by the property. Use this rating to help choose your stay! 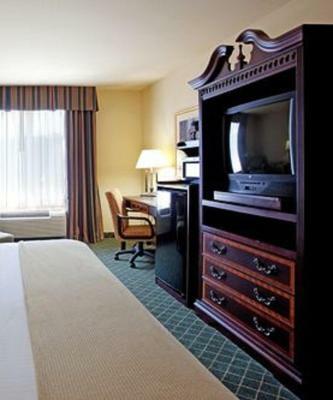 This West Monroe hotel offers spacious rooms with free Wi-Fi and a cable TV. It features an outdoor pool and is just 4.9 miles from the Northeast Louisiana Children’s Museum. 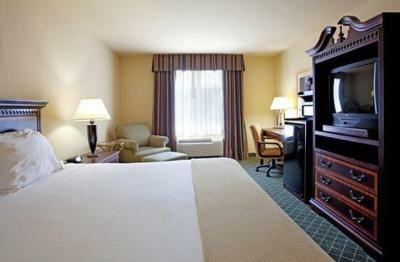 All warmly decorated rooms at the Holiday Inn Express Hotel & Suites West Monroe include a work desk and seating area. 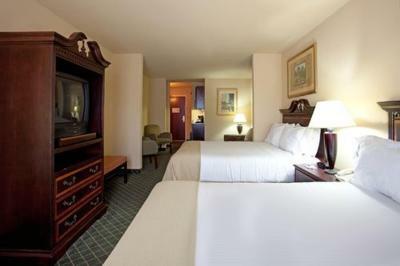 A microwave, refrigerator and coffee maker are provided in every room. Guests can relax in poolside seating on the sun deck or enjoy the nature trail behind this hotel. The on-site fitness center and full-service business center are both available 24/7. The West Monroe Holiday Inn Express offers a daily continental breakfast and guests have access to the on-site barbecue grills. 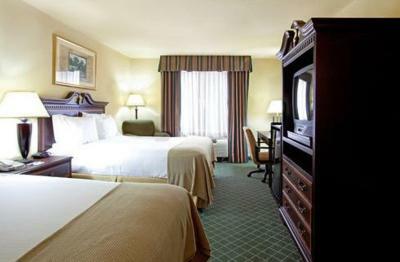 The Monroe Regional Airport is 9.3 miles from this hotel, and the Links At Muny Golf Course is a 15-minute drive away. This property is also rated for the best value in West Monroe! Guests are getting more for their money when compared to other properties in this city. When would you like to stay at Holiday Inn Express Hotel & Suites West Monroe? A seating area and a work desk are included in this room. Tea and coffee-making facilities, a refrigerator, and a microwave are also included. 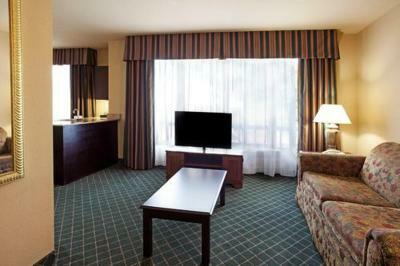 This suite is spacious and features a living area with a sofa bed and a counter area with a sink. House Rules Holiday Inn Express Hotel & Suites West Monroe takes special requests – add in the next step! Holiday Inn Express Hotel &amp; Suites West Monroe accepts these cards and reserves the right to temporarily hold an amount prior to arrival. Holiday Inn Express Hotel & Suites West Monroe accepts these cards and reserves the right to temporarily hold an amount prior to arrival. I didn't have any complaints, I would stay here again. The front desk staff were friendly and helpful. Bathroom was not very clean. Ants on the floor. Desk need cleaning. Refrigerator was not wiped down well you can see smears on the front door. Housekeeping was not friendly, we walked out the room when leaving and she didn't acknowledge us just ask were we gone and I said yes. Seemed very rude. Front desk was okay. I asked for late c/o and she was hesitant like she didn't really want to but, gave it to me anyway. The price I paid was not what I expected at all. 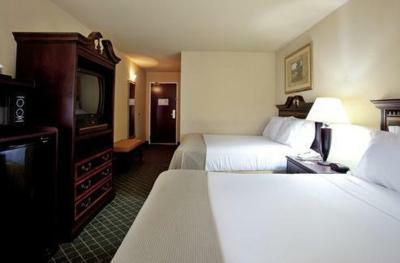 The room was very comfortable, but could have used a central light for evening dressing (very minor issue). Dogs in the hotel and elevator! May have been exposed to fleas and ticks.